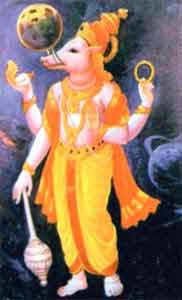 Varaha Dwadashi is dedicated to the Varh or boar avatar of Sri Hari Vishnu – the second incarnation of Lord Vishnu. It is observed on the twelfth day (dwadashi) of the waxing phase of moon (Shukla Paksha) in Magh month. Varaha Dvadasi 2019 date is February 17. It is marked on Feb 16 in certain calendars in North India. The popular belief is that it was on this day Lord Vishnu rescued Mother Earth from demon Hiranyaksha. The belief is that observing the day will help in attaining moksha. The devotee who worships Varaha Avatar on the day will be blessed with good health, peace and prosperity. Special prayers are offered Lord Vishnu in the form of God Varaha. Please note that this day is only observed in some regions and by some Hindu communities. The most important day dedicated to Varaha is the Varaha Jayanti is observed during Bhadrapad Shukla Paksha (August – September). Varaha is installed in a pot filled with water and worshipped on the day. A Naivedya is prepared and usual puja rituals associated with Lord Vishnu are followed. Giving alms and making charity on the day is considered very good.